After 10+ years of designing, seeking funding, and relentless tenacity, we are thrilled to announce the completion of all three phases of the 135th Street Public Improvement Project! Early planning for this huge undertaking began back in 2006 when CID businesses expressed serious concerns about people bypassing Martin City on Highway 150 ending up in Grandview or Leawood to shop and dine. Debbie Van Noy, Owner of Jess and Jim’s Steakhouse and Chairwoman of the Martin City CID Board of Directors said people thought Martin City was going downhill because 135th Street was falling apart. By the end of 2014, Phase one had given 135th Street a major facelift from Holmes Road to Oak Street. Improvements included the addition of a new lane, the installation of a new 60- 66” stormwater line, replacement of a 12” water main line, new curbs, gutters, sidewalks, on-street parking spaces, a new road surface, new landscaping, and a new traffic signal at Holmes Road and 135th Street… YAY! Phase two wrapped up in 2016 and improved 135th Street from Oak Street to Wornall Road. A new street lane was added along with new on-street parking spaces, new sidewalks, waterline replacements, street lighting upgrades, a new storm sewer, new curbs and gutters, a new road surface, and a new traffic signal at Wornall Road and 135th Street. 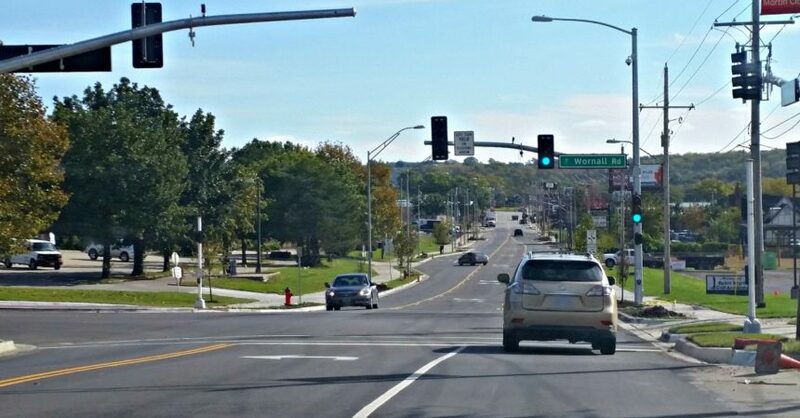 The third and final phase of the 135th Street Improvement project focused on Wornall Road to Highway 150 and gave us a widened, three-lane road with turn lanes, new road surface, curbs, sidewalks, and streetlights, improved storm drainage, and an 8-foot multi-use trail on the north side of 135th Street. Whew! The City of Kansas City, Missouri funded the project through capital improvement dollars and Jackson County helped fund the design work. Phase 3 was funded by GO KC Bonds, approved by KCMO voters in April 2017 to improve streets, sidewalks, flood control and other infrastructure needs over the next 20 years. The Martin City CID funded $600,000+ for expenses, including design costs, right-of-way acquisition, the installation of brick pavers, hanging basket poles, banners, and other beautification enhancements. For years, it’s been a challenge for people to access businesses along 135th Street and as a result of these improvements, people are experiencing Martin City in a whole new way… parking and walking, which wasn’t possible before! The 135th Street Improvement Project was an ongoing team effort and we want to thank the City of KCMO, retired Councilmen John Sharp, Councilman Scott Taylor, Councilman Kevin McManus, the Martin City Community Improvement District Board of Directors, Jackson County Public Works Department, City Manager Troy Schulte, PIAC members, KCMO Public Works Department, KCMO Water Department, South KC Chamber, JM Fahey Construction, all the Martin City businesses located along 135th Street, and all the businesses, community leaders, and supporters who helped us move this project forward! We have a LOT to be excited about in Martin City! Holmes Road… watch out! We’re coming for you next.